Mother and I sat with Elsie at a League of Womens' luncheon in 1980 at which she discovered that I was the man that had bought MY TERN from the Averys and loved it as much as she and Gordon had. From my early days in the V.I. I had admired that little sloop when in storage at Averys' marina and sometimes sailing past the Yacht Club and through Current Cut. There were very few serious sailing enthusiasts on Water Island at that time, but quickly we learned that Elsie loved to sail, so our friendship grew at a rapid pace as we discussed our mutual interests in social problems, music , literature, cultural endeavours, dinner parties and travelling. We developed a great deal of rapport through the years and enjoyed giving mutual support to one another. Our travels together were high adventure -- Saba, Nova Scotia , Newfoundland, the Cook Islands, French Polynesia, Pitcairn and Easter Island. We first met Elsie here in Washington, and only by chance found out about her very strong ties to Water Island. We always felt that she was a friend. I always fely of her as a very strong but very dear person. We will both miss Elsie. We first met Elsie and Gorden on Water Island in the early '50s. We have fond memories of them and their son Charlie--socially--sailing and diving. They were a great family, and Elsie was the best. Elsie was not only a strong part of everyday lives on Water Island, but affected the lives of people on St.Thomas as well. She was active in the League of Women Voters, a good friend & mentor to youth on St.Thomas and an intrepid adventurer. I have fond memories of her in Northern Michigan with us during a seminar several of us attended on needlepoint on Mackinac Island.....our walks in the early morning on the island discussing the flora & fauna we encountered along the way. It also happened to be her 80th birthday & she had not told anyone. Being Water Islanders, it was not a secret for long & Lucy, Jeannie, John & I celebrated it with her to her dismay. She will remain an important part of our lives forever! Thank you Elsie for being a friend. Elsie always had a twinkle in her eyes and when she spoke no matter what she said, it had a smile mixed in with it too! That is a quality of a wholesome spirit. Elsie was a treasure to be around and that is what I will miss. Elsie will always be in my memories and her spirit will be always here on Water Island with us. Elsie was a good friend of mine growing up. She was always so kind and caring. She is a fond memory of my childhood on Water Island. Elsie will be missed by all. Elsie is a part of my earliest memories of Water Island. I so enjoyed seeing her enjoy the simple pleasures of the island - like swimming at Honeymoon Beach each day. She was part of the beauty of this island and I will always think of her as part of my Water Island "family." Elsie will be missed by us. We loved being with Elsie. 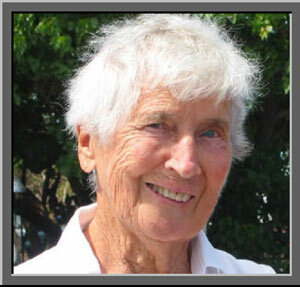 She was a grand lady, avid sailor, a friend with a sharp wit, past president of WICA, and the matriarch of an authentic pioneer family on Water Island.